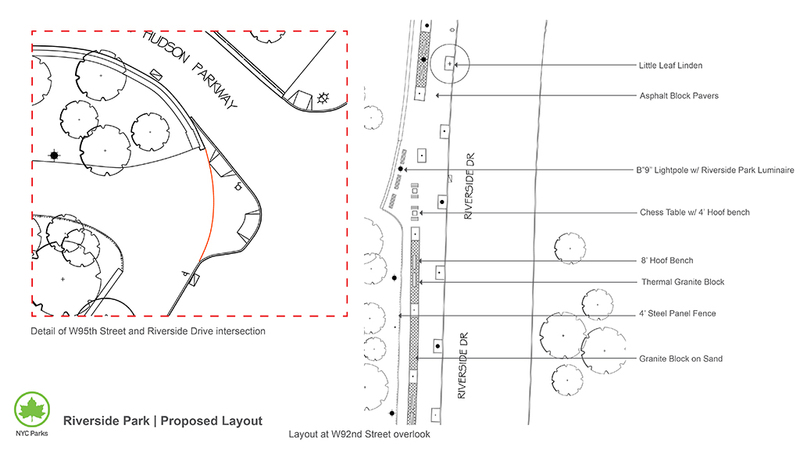 This project will include paving and landscape improvements in Riverside Park. At Riverside Drive between West 122nd and West 125th Streets, the project will reconstruct the existing perimeter sidewalk, including asphalt pavement and new bluestone curb, benches and fencing. At Crabapple Grove between West 91st and West 95th Streets, the project will reconstruct park paths and install new benches. Along the Hudson River Greenway between West 72nd and West 83rd Streets, the project will install additional greenway signage, improve park lighting and reconstruct pavements.